The problem of population explosion has worked in the favor of the global glass fiber market, by creating an unprecedented demand for its products in various sectors. From the automotive to the building and construction sector, the need for glass fiber for various purposes is an undeniable one. Transparency Market Research states that the opportunity in the global glass fiber will be worth US$17.44 bn by 2024 from US$8.50 bn in 2014 as the market promises to expand at a CAGR of 7.5% between 2016 and 2024. The wide range of application of glass fiber is primarily due to its unique characteristics such as low weight, excellent resistance, and high strength. The E-glass fiber has been integral to defining the success of the global glass fiber market. This product has is being largely preferred due to its incredible tensile strength, budget-friendliness, and modulus. The global glass fiber market will largely be driven by the building and construction sector as the exceeding population in certain areas of the world such as Asia Pacific has created a demand for residential buildings. The building and construction application segment is anticipated to rise at a 7.6% CAGR in the forecast period. In the coming years, glass fiber will be used for making furniture and fixtures, pipes, water storage tanks, and wall panels for this sector. However, this market does face a few challenges such as the increasing demand for carbon fiber that is known to have better mechanical characteristics. Not only does this material have better strength, but is also lighter than glass fiber. Citing these reasons, carbon fiber is being widely used in areas of transportation, construction, sports and leisure equipment, and wind energy. Amongst all the application segments, the wind turbine segment is poised to prosper. This trend will continue all throughout forecast period as the word reels under the pressure of global warming. The pursuance of sustainable renewable solutions will propel the demand for glass fibers, which are largely used in making wind turbines. The increasing number of wind turbine installations are also set to accelerate the demand for glass fibers. The mandatory energy regulations will also contribute towards the growth of this application segment in the overall market. 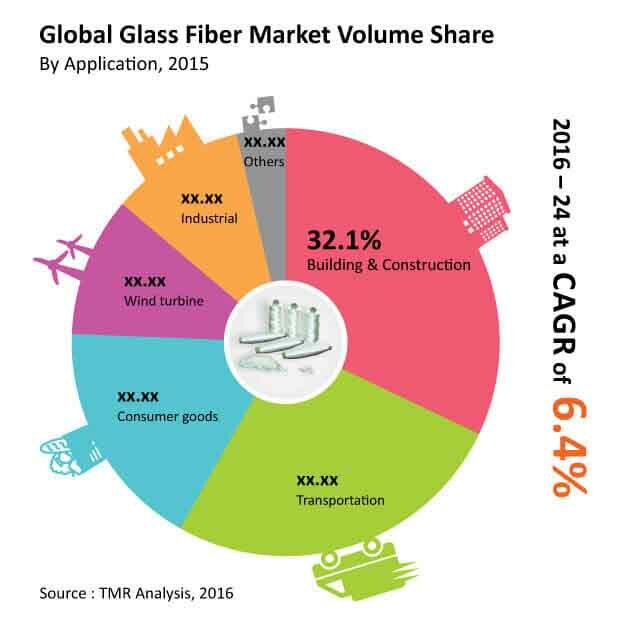 Asia Pacific held a significant share in the glass fibers market, accounting for nearly 48% of the overall market in 2014. This share was attributable to the monumental population base that is the undercurrent for the budding building as construction sector as well. The steady stance of this regional market will continue to grow as emerging economies of China and India become the big exporters of glass fiber during the forecast period. The competitive landscape of the global glass fiber market is consolidated in nature. The top operating players in this market are CHONGQING POLYCOMP INTERNATIONAL CORP, AGY Holding Corp, Jushi Group, Saint-Gobain Vetrotex, Johns Manville, Nippon Electric Glass Co., Ltd, Jiangsu Jiuding New Material Co. Ltd, Taishan Fiberglass, Inc., and Owens Corning, and PPG Industries, Inc. amongst others. Establishing strong export and distribution channels in the international markets will open up bright opportunities for this market. Furthermore, increasing investments in research and development will help these companies improve their product quality, thereby creating a possibility of a niche market in the near future. Glass fibers are ultra-thin strands of glass that are commonly woven in the form of a mat. In conjunction with the resin matrix, these form glass fibers reinforced plastic. Glass fibers are obtained from the chemical reaction between various natural minerals and chemicals at high temperature. Silica sand is the primary raw material used in the manufacture of glass fibers. Various quantities of minerals and chemicals such as feldspar, anhydrous borax, sodium sulfate, alumina, calcium oxide, magnesium oxide, and cullet (recycled glass) are also employed as per the end use requirements of glass fiber. The report provides in-depth analysis and forecast of the glass fiber market on the global as well as regional level. It includes forecast for the period from 2016 to 2024 in terms of volume (kilo tons) and revenue (US$ Mn). Quantitative data has been derived through extensive secondary research of the global glass fiber market. Secondary sources typically include company websites, relevant magazines, government documents, and press releases. The top-down approach has been adopted to derive the regional numbers from global revenue and volume figures. Furthermore, the bottom-up approach has been employed to derive data for various product segments based on demand for glass fiber in each geographic segment. A combination of top-down and bottom-up approaches helps validate the quantitative data. The data was further validated with the help of primary research with industry experts to ensure accuracy of derived numbers. Detailed analysis of various factors driving the global glass fiber market has been included for astute decision making. Impact of these drivers has been included with data to substantiate research findings. Furthermore, factors restraining market growth have been included for better understanding of the market. Impact of these restraints has been analyzed over the course of the forecast period. The report also comprises various opportunities available for market growth during the next eight years. Opportunities entail untapped or recently explored factors that are anticipated to drive the glass fiber market during the forecast period. The report includes value chain analysis to help understand the industry thoroughly. Value chain analysis comprises detailed evaluation of the roles of various entities involved in the glass fiber industry, from raw material suppliers to end-users. Various processes employed in the manufacture of glass fiber have been included in the value chain analysis. Porter’s Five Forces model has been employed to determine the degree of competition in the market during the forecast period. Company market share analysis has been included for better understanding of the competitive landscape. Company market share analysis comprises the market share of dominant players in 2014, based on their production capacities. Furthermore, market attractiveness analysis has been conducted to analyze product segments that are expected to be lucrative during the forecast period. This is based on various factors such as market size, growth rate, profitability, raw material procurement, and competition in each product segment. Based on product, the glass fiber market has been segmented into e-class glass fiber and performance glass fiber. The report comprises detailed analysis of all the segments in the regional and global markets and forecast based on current and future trends in the industry in terms of volume (kilo tons) and revenue (US$ Mn). In terms of region, the market has been segmented into North America, Europe, Asia Pacific, Latin America, and Middle East & Africa. Demand for glass fiber in each of its application segment has been analyzed and forecast for the period of eight years. The report also comprises profiles of leading companies in the glass fiber market. These include AGY Holding Corp, CHONGQING POLYCOMP INTERNATIONAL CORP, Jiangsu Jiuding New Material Co. Ltd, Jushi Group, Johns Manville, Nippon Electric Glass Co., Ltd, Owens Corning, PPG Industries, Inc, Saint-Gobain Vetrotex, and Taishan Fiberglass, Inc. Various attributes of these companies such as company overview, business strategies, and recent developments form the core of the company profiles section.